CRAZY DISCOUNT! Was: $249.95 Now: $89.97! 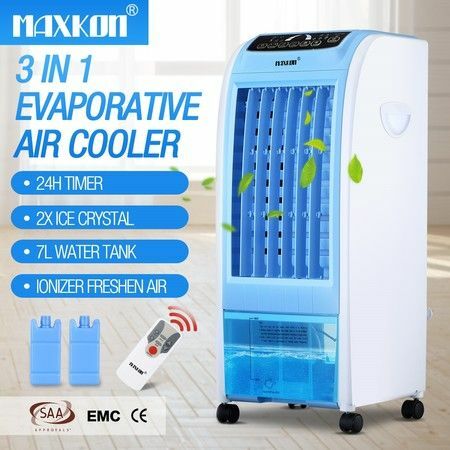 There is a cool breeze in this summer with the 7L Evaporative Air Cooler. Serve yourself a cold drink, and slump on the couch. Even if you don't do anything, that is good enough. This unit is built-in a thick water curtain, which provides strong cold air continuously. There are 3 modes and 3 speeds you can adjust, meeting your different needs. 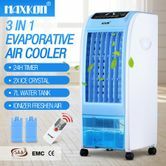 Featuring an ionizer button, the evaporative cooler can release negative ions to freshen the air for caring health. The portable cooler also comes with two ice crystal boxes and a remote control. The air cooler is low power consumption and low noise. And equipped with wheels, it is suitable for living room, bedroom or office. Adjustable Speed: Three-speed air cooler could meet your different needs and be applied on various occasions. Cool: Adopt ice crystal refrigeration and air evaporative technology, can cut down the temperature from the air vent. Deliver Wind at Wide Angle: Swing the blades automatically or manually, deliver wind at the horizontal wide angle. Timing Function: 24-hour timing function makes the air cooler stop automatically after you set the performance time. Large-capacity Water Tank: 7L large-capacity water tank prevents you from adding water continuously. Universal Wheels: you could freely move the air cooler from room to room for its wheels. Very smooth purchase. Thank you.